(1) We have now finished the updates of the Esophagus and Spleen chapters. The topics in the Esophagus chapter were recently reviewed / updated by Israh Akhtar, M.D., Feriyl Bhaijee, M.D. and Elliot Weisenberg, M.D. The topics in the Spleen chapter were recently reviewed / updated by Jaleh Mansouri, M.D. and Vijay Shankar, M.D. (2) On March 26, 2014, we broke a daily record with 24,685 visits. For the month of March 2014, we had a monthly record of 586,057 visits, with a record average daily traffic of 18,905 visits. We will keep working hard to make PathologyOutlines.com an important and valuable part of your Pathology practice. (3) Click here to check our new Updates page, to see what topics have been updated based on reviews or new images. 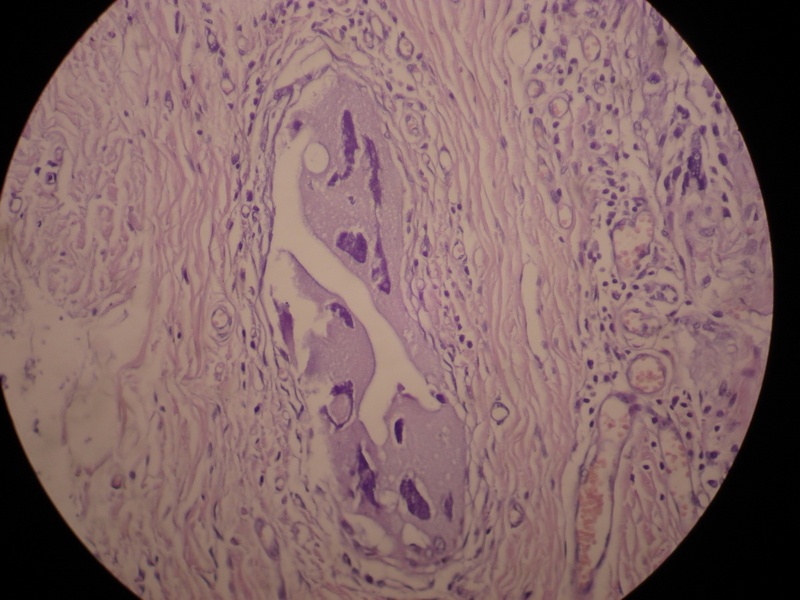 A 37 year old woman had a biopsy with an unspecified breast malignancy, and underwent a modified radical mastectomy. 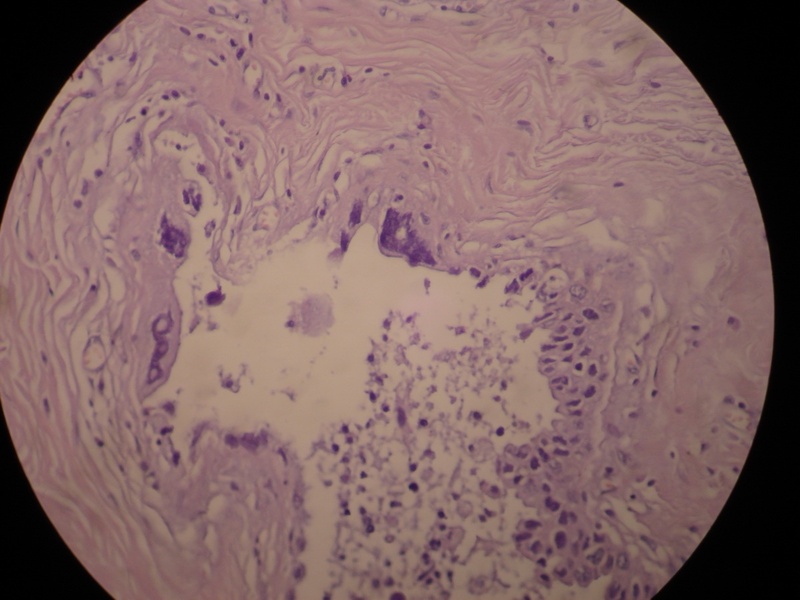 This rare tumor, with < 50 cases reported, was first described in 1981 (Am J Surg Pathol 1981;5:773). 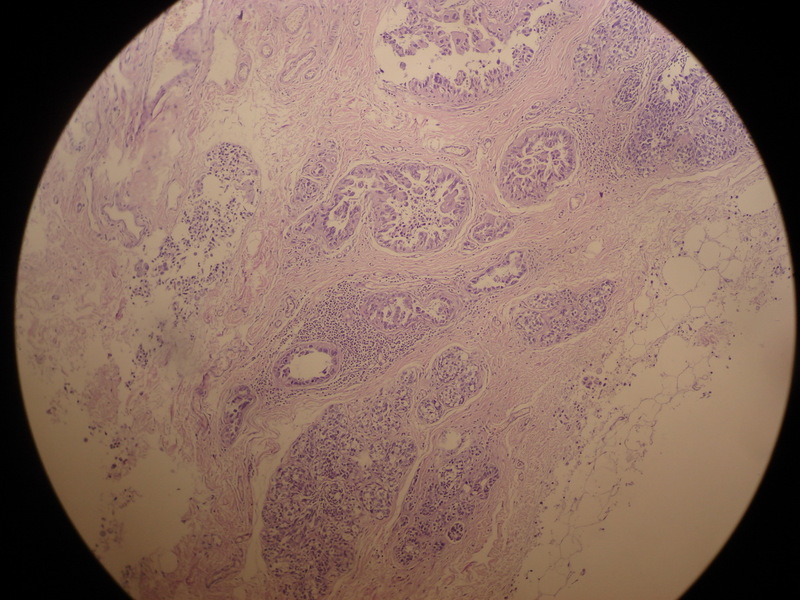 It is considered a variant of breast metaplastic carcinoma, and has malignant cells resembling choriocarcinoma, with immunoreactivity for human placental lactogen and human chorionic gonadotropin. 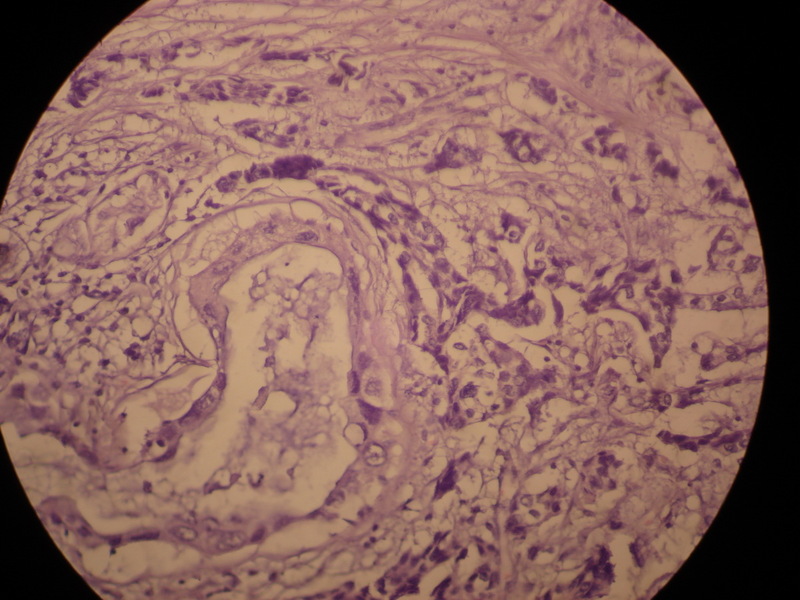 The histologic origin of the syncytiotrophoblast-like cells is unknown, but they are thought to be a metaplastic process (Arch Pathol Lab Med 2011;135:1097). Clinically, these tumors are part of a rapidly growing palpable mass indistinguishable from conventional breast carcinoma. 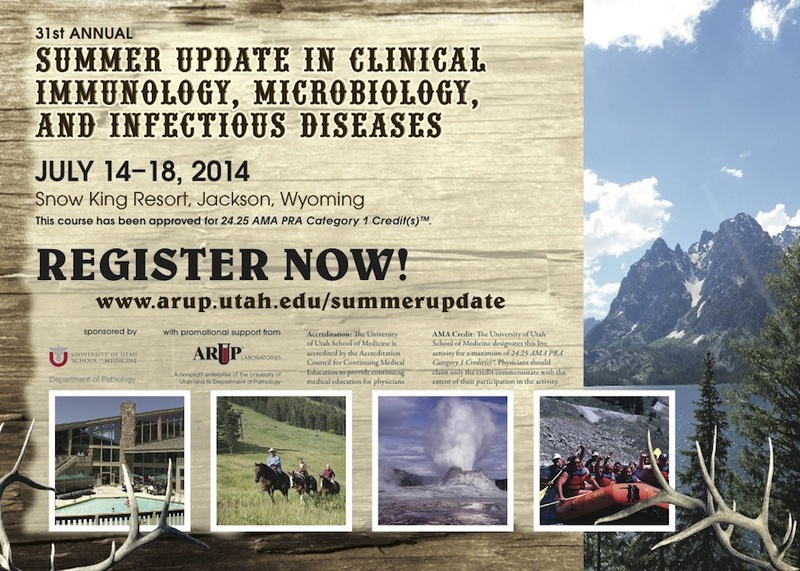 Often, there is locally advanced disease. 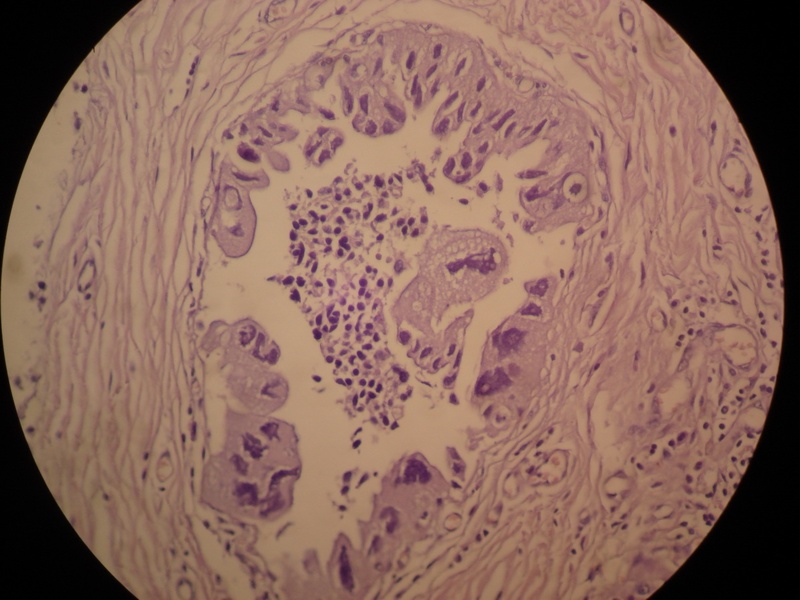 Microscopically, there are markedly pleomorphic, multinucleated choriocarcinomatous cells with abundant eosinophilic cytoplasm and occasional cytoplasmic vacuoles. 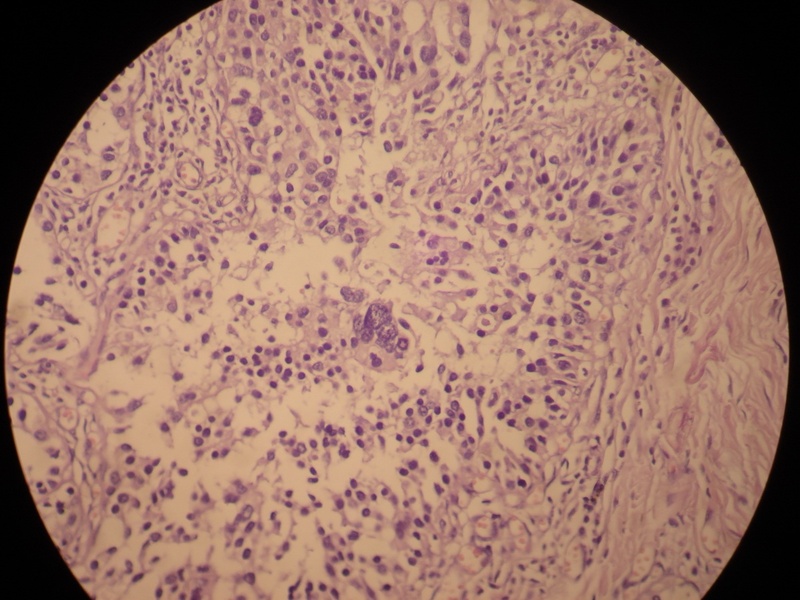 There often is associated DCIS, invasive ductal carcinoma NOS (often moderately or poorly differentiated) or metaplastic carcinoma with heterologous components or sarcomatoid areas. 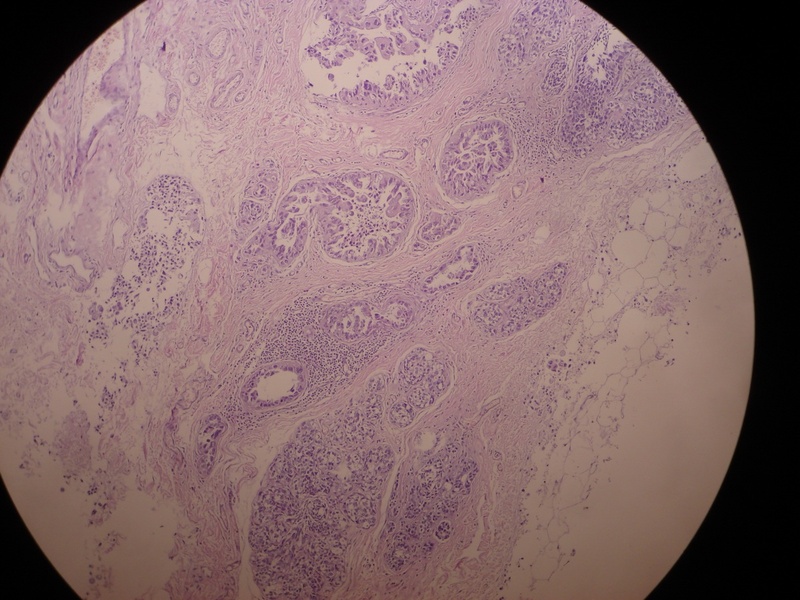 The differential diagnosis includes metastatic ovarian choriocarcinoma, which is usually not accompanied by usual type invasive ductal carcinoma or DCIS. These tumors are usually aggressive, with a poor prognosis. Due to their rarity, an optimal therapeutic approach has not been identified.